I visited the Wadsworth Atheneum during the holiday shopping rush and was surprised at how many others had opted out of shopping in favor of art. The museum, opened in 1844, is the oldest "continuously operating public art museum in the United States," according to Susan Hood, Media Relations Manager. 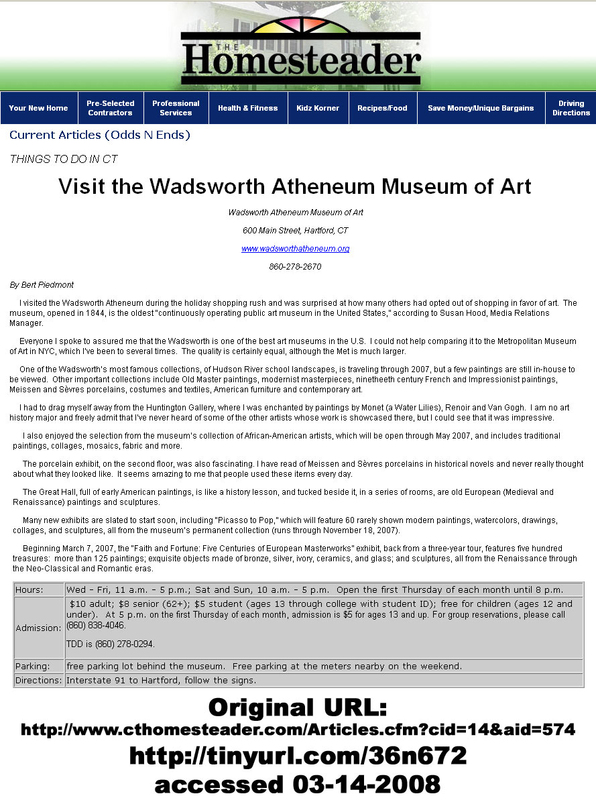 Everyone I spoke to assured me that the Wadsworth is one of the best art museums in the U.S. I could not help comparing it to the Metropolitan Museum of Art in NYC, which I've been to several times. The quality is certainly equal, although the Met is much larger. One of the Wadsworth's most famous collections, of Hudson River school landscapes, is traveling, but a few paintings are still in-house to be viewed. Other important collections include Old Master paintings, modernist masterpieces, nineteenth century French and Impressionist paintings, Meissen and Sevres porcelains, costumes and textiles, American furniture and contemporary art. I had to drag myself away from the Huntington Gallery, where l was enchanted by paintings by Monet (a Water Lilies), Renoir and van Gogh. L am no art history major and freely admit that I've never heard of some of the other artists whose work is showcased there, but l could see that it was impressive. I also enjoyed the selection from the museum's collection of African-American artists, which will be open through Mav 2002, and includes traditional paintings, collages, mosaics, fabric and more. The porcelain exhibit, on the second floor, was also fascinating. I have read of Meissen and Sevres porcelains in historical novels and never really thought about what they looked like. It seems amazing to me that people used these items every day. The Great Hall, full of early American paintings, is like a history lesson, and tucked beside it, in a series of rooms, are old European (Medieval and Renaissance) paintings and sculptures. Many new exhibits are slated to start soon, including "Picasso to Pop," which will feature rarely shown modern paintings, watercolors, drawings, collages, and sculptures, all from the museum's permanent collection. Beginning soon, the "Faith and Fortune: Five Centuries of European Masterworks" exhibit, back from a three-year tour, features five hundred treasures: more than 125 paintings; exquisite objects made of bronze, silver, ivory, ceramics, and glass; and sculptures, all from the Renaissance through the Neo-Classical and Romantic eras.